Many chemical, physical, and biological environmental agents can interact with DNA to induce mutations. When normal function of DNA repair genes or cell proliferation and differentiation control genes is lost as a consequence of mutations, the risk of cancer development increases. Carcinogenesis is a multistep process characterized by genetic, epigenetic, and phenotypic changes, leading to genetic damage, mutation in critical genes related to control of cell division, cell death, and metastatic potential. Radiography is one of the most valuable diagnostic tool used in comprehensive dental care. Radiographs taken in dental clinics are essential for proper diagnosis and treatment plan. The use of ionizing radiation in dentistry, and in general medicine, has been rapidly increasing. Today, a complete radiographic survey of the mouth is considered as an essential adjunct to diagnosis. Although it is generally accepted that there is no safe level of radiation exposure, the possible risk associated with exposure to X-rays must be compared against the benefits of clinical interpretation. It is well-known that ionizing radiation damages DNA, including single and double strand breaks and DNA protein crosslinks, and induces cellular death. Taking in to account the strong evidence of a relationship between DNA damage and carcinogenesis, it would be useful to know to what extent the dental X-rays cause genotoxic and cytotoxic effects resulting in DNA damage on oral mucosa. Hence, the present study is carried out to evaluate and compare the DNA damage (micronucleus) and cellular death (pyknosis, karyolysis, and karyorrhexis) in oral exfoliated cells from individuals following conventional full mouth radiographs, as well as to compare DNA damage and cellular death in different parts of the oral cavity such as gingiva and buccal mucosa following dental radiography. This study was conducted among 30 patients after obtaining the ethical clearance and patients' consent. The patients with periodontal diseases who were referred from the department of periodontics were exposed to conventional full mouth series of radiographs, and the following protocol was followed such as 16 intraoral periapical films (14 periapical + 2 bitewings) with 65 kV, 07 mA with bisecting angle technique, E-speed film with SNAP-A-RAY holder, and round collimator. The study group consisted of both the sexes above the age group of 30 years. None were alcohol or tobacco consumers and were not submitted to ionizing radiation 15 days prior to the study. Exfoliative cells were collected from the buccal mucosa and gingiva of the patients just before exposure and 10 days after exposure to radiographs. Patients were informed not to undergo any other diagnostic radiographs in this 10-day period. Prior to collection, patients were asked to rinse their mouth gently with water. Then, buccal mucosa and gingiva were gently scraped with the help of sterile and moist wooden spatula to collect cells. The cells were immediately smeared on precleaned microscopic slides and allowed to air dry, and all slides were fixed with 80% isopropyl alcohol. Later, the air-dried slides were stained using the Feulgen/Fast Green method and examined under a light microscope at 400× magnification to determine the frequency of micronuclei count (MNC). A total of 1000 cells were scored from each patient for each sampling time and site (before and after X-ray exposure) and were expressed as percentages for statistical analysis. The paired-samples t-test and the Wilcoxon test were used to compare the frequencies of cell death and MNC, before and after X-ray exposure. Independent sample t-test was used to compare buccal mucosa and gingiva of the oral cavity in the study group. The statistical analysis was performed using SPSS 15 version software (SPSS Inc., 233, South Walker Drive, 11th Floor, Chicago). The mean frequency of micronuclei were compared before and after exposure to full mouth radiographs in the buccal mucosa and gingiva individually, although MNC was increased in both the sites after exposure, however, the difference was not statistically significant (P > 0.05) [Table 1], [Table 2] and [Figure 1]. Comparison of difference of micronuclei between buccal mucosa and gingiva of full mouth exposure was found to be significant (P < 0.05) [Table 3]. The mean frequencies of other nuclear alterations are compared before and after exposure to full mouth radiographs on buccal mucosa and gingiva individually [Table 4], [Table 5] and [Figure 2], [Figure 3], and comparison was found to be significant (P < 0.001) [Table 6], with the mean of difference being high in buccal mucosa, i.e., 11.38 ± 2.49 than gingiva 5.3 ± 1.89. Ionizing radiation is a well-known mutagen and carcinogen in the human population. The fact that ionizing radiation produces biological damage has been known for many years, however, the first case of human injury was reported in the literature just a few months following Roentgen's original paper in 1895 announcing the discovery of X-rays, and in 1902, the first case of X-ray-induced cancer was reported. The mechanism by which radiation causes damage to human tissue, or any other material, is by ionization of atoms in the material. In order to detect the radiation effects of low-dose diagnostic radiographic exposures, a sensitive analysis and specific approach are needed. To date, a variety of assays have been idealized, including those that assess metaphase chromosomal aberrations, sister chromatid exchanges, host cell reactivation, cytogenetic analyses for chromosomal alterations in human peripheral blood lymphocytes (the most sensitive techniques for biomonitoring human radiation exposure), and chromosomal aberrations and micronuclei formation in human lymphocytes are even reliable bio-dosimetres for average whole-body absorbed dose estimation. However, these methods are typically laborious and time consuming or require highly trained technicians to accurately read and interpret slides. For this purpose, a great deal of enthusiasm was raised by the application of the micronucleus test to uncultured exfoliated cells. The oral epithelium maintains itself by continuous cell renewal, whereby new cells are produced in the basal layer by mitosis and migrate to the surface replacing those that are shed. The basal layer contains the stem cells that may express genetic damage (chromosome breakage or loss) as micronuclei during nuclear division. The daughter cells, which may or may not contain micronuclei, eventually differentiate into the prickle cell layer and the keratinized superficial layer, and then exfoliate into the oral cavity. Some of these cells may degenerate into cells with condensed chromatin, fragmented nuclei (karyorrhectic cells), pyknotic nuclei, or completely lose their nuclear material (karyolitic or “ghost” cells). These biomarkers of genome damage (e.g., micronuclei) and cell death (e.g., apoptosis, karyolysis) can be observed in both the lymphocyte and buccal cells. Hence, the various damages which occur in cells after exposure to radiation include both cytotoxic and genotoxic effects. 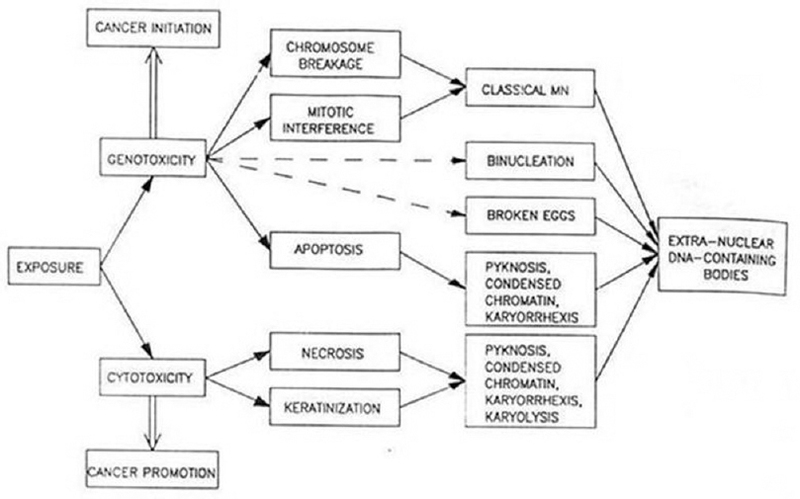 Cytotoxicity which causes cancer promotion is indicated by pyknosis, karyorrhexis, and karyolysis, occurring at elevated levels in response to cellular injury [Figure 4]. The micronuclei represent genotoxic marker; hence, in the present study, micronucleus and karyolysis, pyknosis, and karyorrhexis were counted before and 10 days after exposure to full mouth radiographs. The maximal rate of micronuclei formation in exfoliated cells is seen between 1 and 3 weeks after exposure to the genotoxic agent. Therefore, a period of 10 days after exposure was adopted in this study. The micronucleus assay in exfoliated buccal cells was first proposed in 1983 and serves as an excellent biomarker for DNA damage. The collection of buccal cells is arguably the least invasive method compared to blood samples or tissue biopsies for measuring DNA damage in humans. In our study, the mean frequency of micronucleus in buccal mucosa and gingiva before exposure was 0.14 ± 0.18 and 0.06 ± 0.11 and after exposure was 0.17 ± 0.28 and 0.08 ± 0.09, respectively; this difference was not statistically significant. 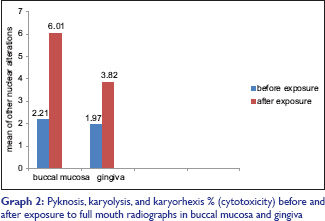 The mean frequency of other nuclear alterations indicating cytotoxicity in buccal mucosa and gingiva before exposure was 2.21 ± 0.35 and 1.97 ± 0.25 and after exposure was 6.09 ± 0.80 and 3.82 ± 0.49, respectively; this difference was statistically highly significant [Graph 1] and [Graph 2]. Hence, in the present study, the mean micronucleus frequency in buccal mucosa and gingiva after exposure to full mouth radiographs was raised, however, it was not significant statistically (P > 0.05). There was a significant increase (P < 0.05) in other nuclear alterations (pyknosis, karyolysis, karyorrhexis) indicating cytotoxicity after exposure in both the groups. It is important to stress that cytotoxicity interferes with micronucleus induction because some micronucleated cells are inevitably lost after cytotoxic insult, confirming the lack of mutagenic effect induced by X-ray. This is because repeated exposure to cytotoxicants can result in chronic cell injury, compensatory cell proliferation, hyperplasia, and ultimately, tumor development. Cerqueira et al. evaluated the genotoxic effect of X-rays emitted during dental panoramic radiography in exfoliated cells from oral epithelium through a differentiated protocol of the micronucleus test. The frequencies of micronuclei, karyolysis, and pyknosis were similar before and after exposure (P > 0.05), whereas the condensation of the chromatin and the karyorrhexis increased significantly after exposure (P < 0.001). The results suggested that X-ray exposure during panoramic dental radiography induces a cytotoxic effect by increasing apoptosis. A Similar study was done by Popov et al. and Angelieri et al., and there was no significant (P > 0.05) increase in the frequency of cells with micronuclei. However, on the other hand, radiation did cause other nuclear alterations closely related to cytotoxicity including karyorrhexis, pyknosis, and karyolysis. Taken together, these results indicated that panoramic dental radiography might not induce chromosomal damage but may be cytotoxic. Lorenzoni et al. evaluated DNA damage (micronucleus (MN)) and cellular death (pyknosis, karyolysis, and karyorrhexis) in exfoliated buccal mucosa cells from children undergoing orthodontic radiographs (lateral cephalographic, posteroanterior view, panoramic, full periapical exam, and bitewing). The study concluded that the complete set of radiographs requested in the orthodontic planning may not be a factor that induces chromosomal damage, however, it is able to promote cytotoxicity. The results in the present study are consistent with other studies conducted on extraoral projections, but in the present genotoxic and cytotoxic changes were seen in patients exposed to full mouth set of radiographs, which is not reported in the literature to best of our knowledge. 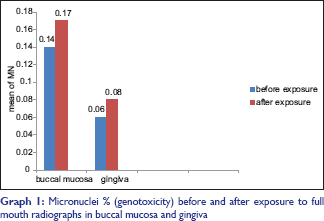 In our study, the difference of micronucleus and other nuclear alterations in buccal mucosa was 0.087 ± 2.0 and 11.38 ± 2.49, and gingiva was 0.013 ± 0.13 and 5.38 ± 1.89, respectively, showed statistically significant results (P < 0.005); hence, after exposure to full mouth set of radiographs, the mean frequency of micronucleus and other nuclear alterations were high in buccal mucosa when compared to gingiva [Graphs 1 and 2]. Sheikh et al. evaluated the genotoxic effects of X-rays on gingiva and buccal epithelial cells during panoramic dental radiography using the micronucleus test, the mean MNC of gingival epithelial cells before and after exposure was increased, and was statistically significant (P < 0.05). Similarly, there was an increase in the post exposure MNC in the buccal mucosa, which was nonsignificant (P > 0.05). Angelieri et al. compared and evaluated DNA damage (micronucleus) and cellular death (pyknosis, karyolysis, and karyorrhexis) in exfoliated oral mucosa cells from smokers and nonsmokers submitted to dental X-ray using two anatomic sites: buccal mucosa and lateral border of the tongue. The results pointed out no statistically significant differences of micronucleated oral mucosa cells before versus after X-ray exposure for both oral sites of smokers or to non-smokers. X-ray exposure was able to increase other nuclear alterations closely related to cytotoxicity such as karyorrhexis, pyknosis, and karyolysis for two groups evaluated. The most pronunciated effects were found on lateral border of the tongue of smokers. In general, the epithelial turnover rates vary between 4 and 14 days. The epithelial turnover rate (time from basal replication to desquamation) for oral mucosa varies with different anatomical sites of the oral cavity depends on keratinization, where nonkeratinized lining mucosa (e.g., ventral tongue, labial mucosa, soft palate) has 1.5 to 5 times more turnover rate than keratinizing masticatory mucosa (e.g., attached gingiva, hard palate). The more keratinized surface, generally is more resistant to physical and chemical trauma compared to nonkeratinized surface. The constant cellular division associated with epithelial renewal that renders the oral cavity susceptible to damage of nonkeratinized surface such as buccal mucosa by the anticancer therapies such as radiation therapy and chemotherapy resulting in damage and killing the dividing cells by damaging DNA or interfering with cell division., Hence, buccal mucosa with high turnover rate and being nonkeratinized showed more cytotoxic effects compared to gingiva. Our present study was consistent with the study carried out by Lorenzoni et al. in 2012, as they evaluated and compared mutagencity and cytotoxicity in exfoliated buccal mucosa cells of children following cone beam computed tomography (CBCT) and conventional radiographs for orthodontic planning. Differences in radiation dose, frequency of exposition, type of cells evaluated, and site of collected cells may influence the results of the micronucleus test and the literature shows that micronucleus and cellular death increase with radiation dose. The total radiation doses in the full mouth radiographs group varies between 34.9 µsv to 388 µsv. Memon et al. found an elevated risk of developing thyroid cancer in patients that have had repeated dental X-rays by doing a population based case control interview. According to the study, patients who had upto four dental X-rays were more than twice as likely to have developed the disease. By receiving between 5 and 9×-rays, the risk increased more than four-fold, and those who had had 10 or more X-rays had a 5.4 times higher risk than someone who had never been X-rayed. Elizabeth et al. also found an association between dental X-rays and the risk intracranial meningioma. The results of the present study suggest that dental X-rays can induce cytotoxic effects in oral mucosa cells and cellular death is considered to be a prime mechanism in nongenotoxic mechanisms of carcinogenesis. Moreover, the frequency of micronuclei indicating genotoxicity increased after exposure, however, the difference is not significant statistically. Although dental radiology contributes to a small dose – but not necessarily to insignificant – portion, dental X-rays should be used only when necessary following the ALARA principle. Cerquira EM, Meireles JR, Junqueira VC, Gomes-Filho IS, Trindade S, Machado-Santelli GM. Genotoxic effects of x-rays on keratinized mucosa cells during panoramic dental radiography. Dentomaxillofac Radiol 2008;37:398-403. Ribeira DA, de Oliveria G, de Casrto GM, Angeleiri F. Cytogenetic biomonitoring in patients exposed to dental X-rays. Comparison between adults and children. Dentomaxillofac Radiol 2008;37:404-7. Angelieri F, Carlin V, Saez DM, Pozzi R, Rabeiro DA. Mutagenicity and cytotoxicity assessment in patients undergoing orthodontic radiographs. Dentomaxillofac Radiol 2010;39:437-40. Frankel. Biological Effects of Ionizing Radiation Principles of Radiation Protection. UW Environmental Health and Safety; 2006. White SC, Pharaoh MJ. Oral Radiology: Principles and Interpretations. 7th ed. St. Louis: Mosby; 2014. Popov L, Kishkilova D, Hadjjdekova VB, Hristova RP, Atanasova P, Hadjjdekova VV, et al. Micronucleus test in buccal epithelium cells from patients subjected to panoramic radiography. Dentomaxillofac Radiol 2007;36:168-71. 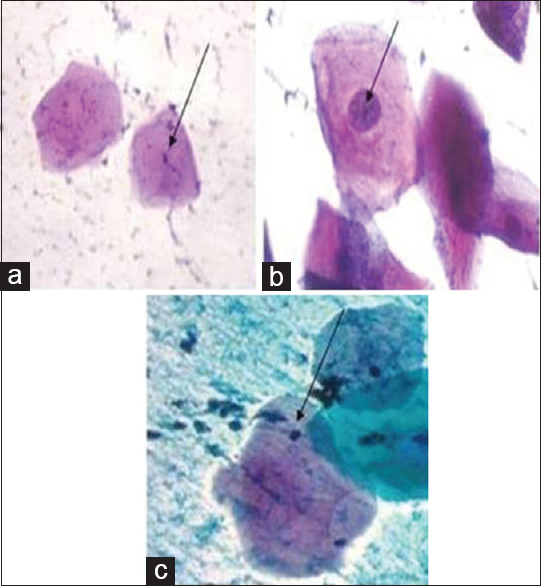 Ribeiro DA, Sannomiya EK, Pozzi R, Miranda SR, Angelieri F. Cellular death but not genetic damage in oral mucosa cells after exposure to digital lateral radiography. Clin Oral Invest 2011;15:357-60. Holland N, Bolognesi C, Kirsch-Volders M, Bonassi S, Zeiger E, Knasmueller S, et al. The micronucleus assay in human buccal cells as a tool for biomonitoring DNA damage: The HUMN project perspective on Current status and knowledge gaps. Mutat Res 2008;659:93-108. Tolbert PE, Shy CM, Allen JW. 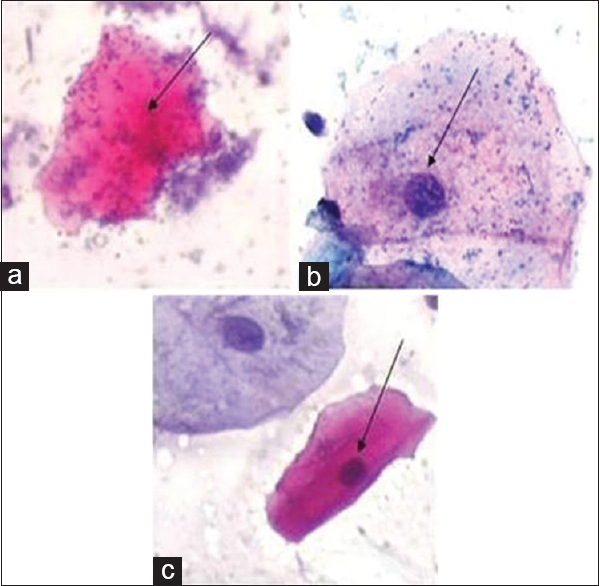 Micro nuclei and other nuclear anomalies in buccal smears: A field test in snuff users. Am J Epidemiol 1991;134:840-50. Ribeiro DA. Cytogenetic biomonitoring in oral mucosa cells following dental X ray. Dentomaxillofac Radiol 2012;41:181-4. Cerqueira EM, Gomes-Filho IS, Trindade S, Lopes MA, Passos JS, Machado-Santelli GM. Genetic damage in exfoliated cells from oral mucosa of individuals exposed to X- rays during panoramic dental radiographies. Mutat Res 2004;562:111-7. Angelieri F, de Oliveira GR, Sannomiya EK, Ribeiro DA. DNA damage and cellular death in oral mucosa cells of children who have undergone panoramic dental radiography. Pediatr Radiol 2007;37:561-5. Lorenzoni DC, Fracalossi ACC, Carlin V, Ribeirod DA, Sant Anna EF. Cytogenetic biomonitoring in children submitting to a complete set of radiographs for orthodontic planning. Angle Orthod 2012;82:585-90. Sheikh S, Pallagatti S, Grewal H, Kalucha A, Kaur H. Genotoxicity of digital Panoramic radiography on oral epithelial tissues. Quintessence Int 2012;43:719-25. Angelieri F, de Cássia GMT, Carlin V, Oshima CT, Ribeiro DA. Biomonitoring of oral epithelial cells in smokers and non-smokers submitted to panoramic X-ray: Comparison between buccal mucosa and lateral border of the tongue. Clin Oral Investig 2010;14:669-74. Squier CA, Kremer JM. Biology of Oral Mucosa and Oesophagus. J National Cancer Inst Monogr 2001;29. Antonio N, Tencate AR. Tencate's oxal histology: Devolopmental, structure nad function. St. Louis: Mosby; 2013. Lorenzoni DC, Fracalossi ACC, Carlinc V, Ribeiro DA, Sant Anna EF. Mutagencity and cytotoxicity in patients submitted to ionizing radiation. A comparison between cone beam computed tomography and radiographs for orthodontic treatment. Angle Orthod 2012;83:104-9. He JL, Chen WL, Jin LF, Jin HY. Comparative evaluation of the in vitro micronucleus test and the comet assay for the detection of genotoxic effects of X-ray radiation. Mutat Res 2000;469:223-31. Ludlow JB, Davies-Ludlow LE, White SC. Patient risk related to common dental radiographic examinations: The impact of 2007 International Commission on Radiological Protection recommendations regarding dose calculation. J Am Dent Assoc 2008;139:1237-43. Memon A, Godward S, Williams D, Siddique I, Al-Saleh K. Dental x-rays and the risk of thyroid cancer: A case-control study. Acta Oncol 2010;49:447-53. Elizabeth B, Calvocoressi L, Bondy, ML, Schildkraut, JM, Wiemels JL, Wrensch M. Dental X-rays and risk of meningioma. Cancer 2012;118:4530-7.